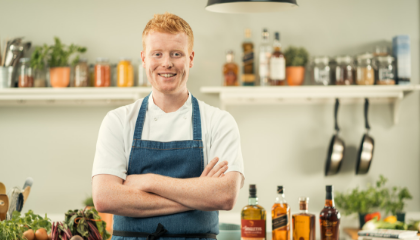 We talked to Diageo’s new Global Gastronomer, Mark Moriarty - listed on Forbes’ ’30 Under 30’ for Innovation in the Arts Sector and previously awarded San Pellegrino Young Chef of the Year (2015) – about the benefits of using spirits with food to amplify flavours and win dining occasions. As a keen teenager and troublesome fisherman in Ireland, the desire to learn how to cook what I had caught ignited something inside of me and introduced me to an education in the culinary world. After receiving my Culinary Arts degree, I set up an international pop-up restaurant experience that permitted me to cook around the world in places like: Hong Kong, Cape Town, Milan, Moscow and my hometown of Dublin. My role as Diageo’s Global Gastronomer is the first of its kind in the industry. It tasks me with exploring food and gastronomy culture, looking at the culinary occasion(s) to help forge a more meaningful connection between food and spirits. Heightening the guests’ experience should influence everything we do – in the kitchen, bar or any role in hospitality. Supplementing or supporting a food menu with complimentary, carefully-considered cocktails (or vice versa) is a natural answer to elevate the overall guest experience. To take things a step further, telling a spirits’ story or flavours through cuisine adds to the over-arching narrative of an experience for customers (along with ambiance, service, setting, etc.). It allows you and your establishment to weave a wider, more detailed story about the concept or flavours you’re trying to achieve. A Zacapa Old Fashioned, for example, can be elevated tenfold by serving it alongside a delicious cube of ripened mango, coated in toasted pine nut crumble with Maldon salt and orange powder. Now, the flavours of the cocktail are reflected in the dish a synergy exists between the drink and in an accompanying bite, greatly enriching the overall experience. Of course, another way to achieve this at the bar is by creating aperitif and digestif serves to preclude or follow a dish. As mentioned, the addition of food can elevate a guest experience as it creates fuller, richer connections. Allowing guests to eat and drink in the same place keeps them in establishments longer, boosting the average spend per head. 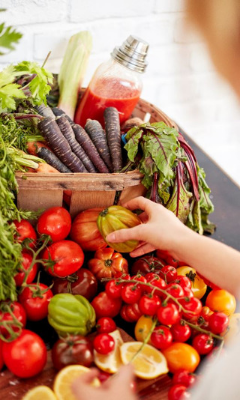 This gives you a longer window to drive your profitability through food and drink occasions. Simple, tasty dishes that are impressive but easy for a limited kitchen team to prepare (often in tight spaces) are a clever way of attracting new audiences to buying cocktails and increasing spends per head. The best way to promote a combined food and spirits offering is through small, concise bar menus ran in conjunction with corresponding drink menus. The key to making this work is for the bar team to reflect the food through drinks creations, or vice versa. 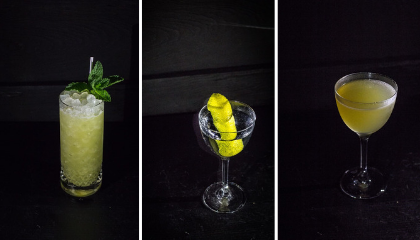 This way, a bartender can articulate the role of both the food and drinks to the customer; creating a unique, authentic experience and adding value to both products. Aperitif and digestif occasions around brunch, lunch, dinner – are a great model to operate around, as food can be served with spirits for any occasion really. In my opinion, the aperitif occasion is one of the best to serve food alongside spirits; the palate is fresh, awake and responsive to absorbing more flavours. Mentally, too, guests are awake and anticipating food so it can be a great time to offer novel drinks to more open minds. For example, a beautiful starter of fresh crabmeat salad, with radish, green apple, citrus and toasted sourdough is the ideal reflection of Tanqueray No. TEN and tonic with grapefruit, which could be served as an aperitif or during the meal. Or a Ketel One Bloody Mary can be perfectly reflected at brunch by a course of poached eggs royale with smoked salmon, hollandaise and esplette pepper. I hope some of my examples have inspired you to start serving food and spirits in your venue. 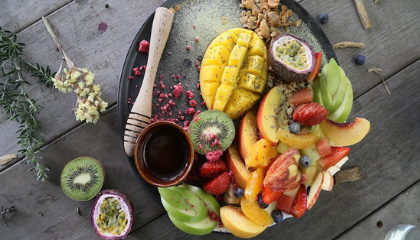 For more practical tips on everything from how to promote aperitifs and digestifs in your venue to some more example serves, take a look at the recent DBA webinars here. 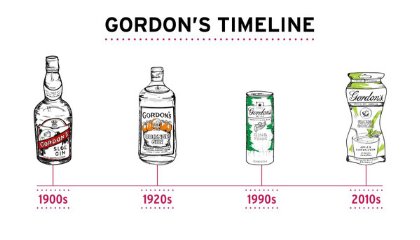 Obviously, different flavours and different styles of drink fit into different occasions. For example, you are less likely to suggest a peated single malt Scotch served neat during a brunch occasion. 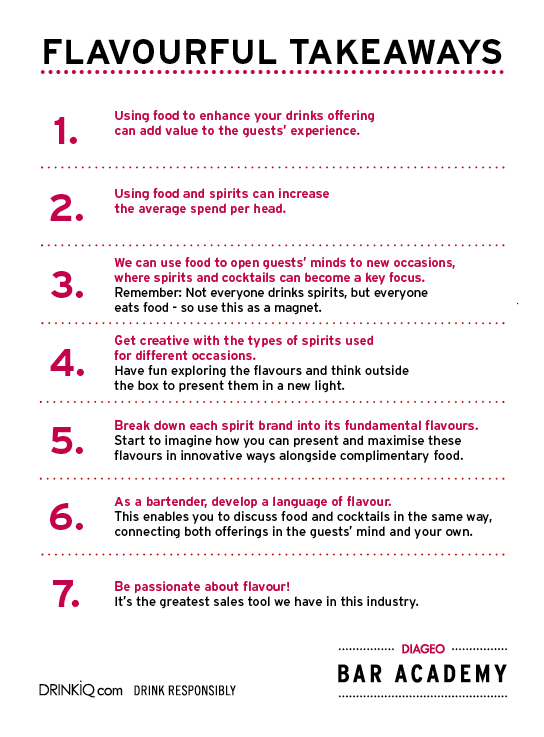 To tackle this, I often categorise different spirit brands based on the flavours I see useful as a chef. Then, I break these down into categories of applicable cuisines and eating occasions. Below, is an example of my process that may serve as a useful guide for anyone in hospitality seeking to create suitable drinks for different food occasions around central flavours. OCCASION: Aperitif – the citrus notes from the Tanqueray No. TEN come to the fore in an Aviation, flanked by a nice balance of chamomile and juniper. This combination of acidity and sweetness nicely cleanses the palate and I would serve something like roast scallop with a warm juniper emulsion to reflect the Aviation. The sweetness of the caramelised scallop is offset by the acidity of a juniper emulsion that incorporates mustard, vinegar and lime juice – pleasantly echoing some of Tanqueray No. TEN’s brighter notes. OCCASION: Digestif – the rum’s sweeter pineapple notes and orange zest, closely tailed by layers of dark chocolate, make a Zacapa Old Fashioned a perfect after dinner choice. To elevate the occasion, my menu would entail a delicious cube of ripened mango, coated in a toasted pine nut crumble with Maldon salt and orange powder. The dish reflects the warmth and nuttiness of Zacapa; drawing tropical, zesty notes to centre stage and heightening the senses with flavour cues from the food and the drink. 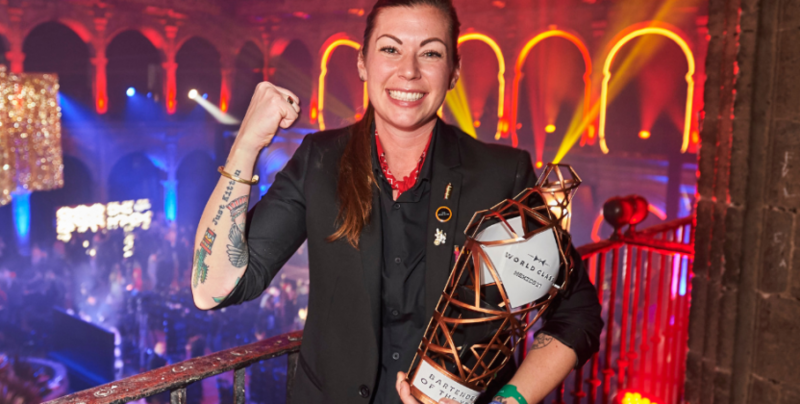 World Class 2017 winner, Kaitlyn Stewart, tells us about a whirlwind year of travelling the globe, visiting some of the best bars and offers us some inspired serves. With a history that’s almost as rich as the drink itself, the espresso martini is a staple on any cocktail menu worth its salt. Terry Cashman, dives into the story behind this modern classic and reveals his golden rules for the perfect serve.